A photograph shows the 27 newly elected TDs – watchful, wary, like coiled springs – knowing their battle was only beginning. Just 90 minutes before the assembly, the Mansion House on Dublin’s Dawson Street had hosted an ‘entertainment’ for the expatriated prisoners of war from Germany after World War I. The street was decked with Union Jacks and bunting. To the beat of their army drum, soldiers with the Royal Dublin Fusiliers had marched out of the building past the queue of people patiently waiting to go inside to watch the first Dáil Éireann in session. One hundred years on, organisers did as much as they could to recreate the environment of 1919 – but they could only go so far. Our imaginations had to supply the rest. Up at the top table, the Ceann Comhairle Seán Ó Fearghaíl was getting his make-up done, unruffled as somebody dabbed him with the powder necessary for live TV. With the sight of so many of our elected representatives eagerly clamouring for ‘selfies’ in front of the stage, you might have thought this was all too much of a stretch for the powers of imagination. But things haven’t changed all that much – because the ‘Evening Herald’ at the time reported that the newly elected deputies a century ago also “had to submit to being photosnapped” as they arrived. Dimly lit ‘gas light effect’ globe lights hung from the ceiling of the Round Room and swathes of blue fabric around the balcony summonsed up the atmosphere of the time. Back then, amongst those present had been Maud Gonne, a number of American naval officers and the Republican priest, Fr Michael O’Flanagan, who gave the opening prayer. This time, former President Mary McAleese, Taoiseach Leo Varadkar, former Taoisigh Bertie Ahern, Brian Cowen and Enda Kenny, members of Dáil Éireann and Garda Commissioner Drew Harris were amongst those in attendance. Archbishop of Dublin Diarmuid Martin and Archbishop of Armagh Eamon Martin and other Church leaders were present. Mike Nesbitt, the former Ulster Unionist Party leader, and Colum Eastwood, leader of the SDLP, were amongst politicians from the North who had travelled for the event. Under the confines of live television, everyone was under strict orders to be in their seats for 3pm. Out in the lobby stood the President, expectantly waiting his cue. And then we were off, with traditional harp music to set the mood and the Ceann Comhairle began his opening remarks. What a number of weeks they must have been, he reflected of that time. But if the voices of those first TDs could be heard, what would they say about us and of the Ireland of today, he asked. Many social challenges – housing, health, inequalities, still remain. This was a theme that echoed throughout the rest of the speeches – with the realisation that there is still much to do to deliver upon the Ireland that was promised back then. 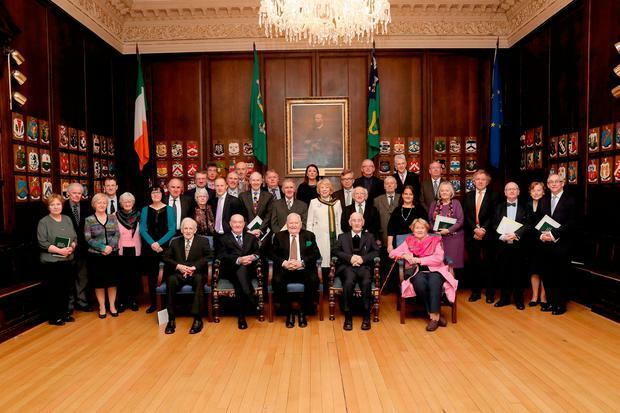 President Higgins said the Democratic Programme of the first Dáil had clearly stated the duties and obligations of the new republic to its people. “It shall be the first duty of the Government of the Republic to make provision for the physical, mental and spiritual well-being of the children, to secure that no child shall suffer hunger or cold from lack of food, clothing or shelter, but that all shall be provided with the means and facilities requisite for their proper education and training, as citizens of a free and Gaelic Ireland,” he quoted. His words hung starkly in the Round Room. He spoke of the aspirations of that first Dáil – its ideals of national freedom and dreams of economic and social justice. “For our forebearers were not merely opening a legislative assembly, they were founding a new nation, one capable of articulating and vindicating the rights and aspirations of the Irish people,” he pointed out. That first Dáil drew its support not only from the will of the people of Ireland but from Irish people across the world, he said. “We are and we must never forget, a migratory and diasporic people,” said the President. The same challenges that confronted the revolutionary generation still abide with us today, he warned. “We struggle to meet the needs of all our people,” he said. The President ended with a rallying cry to battle – to continue in our mission ‘to build a republic of liberty, equality and justice for all’. After he left, the Ceann Comhairle rang his bell for the order of business. “A familiar sound,” he smiled. The Taoiseach began the next leg of the proceedings, describing that first meeting of the Dáil as a ‘bold exercise in democracy’. And then voices from across the political spectrum chiming in, all with their own reminder of what remains to be achieved.